Road-tripping cars from 100,000 to 200,000 miles. Today marks a record for 2nd100k.com. It is the busiest day for visitors ever in the history of the site. Granted, it was only 45 page views, but considering the average of 3-4 views per day, it was an extremely busy day for it. Driving today wasn't any near as interesting. I have started to plan my next trip however! The goal is a 3 reprise trip to Toronto sometime in Mid-October. I have yet to decide whether I'll be taking the Nissan or the Volvo. Some kinks have to be straightened out in the Volvo before I can take it. Tomorrow's big event is going to be an errand to the Springfield Mixing Bowl. Quick Day Trip to Afton, Virginia. So I wasn't planning on the trip down to see my sister becoming an overnight. But, that's what it became. The drive down to just east of Charlottesville, Virginia was...while not fast necessarily, smooth with no issues. The route my GPS unit took me was straight down US-29, to I-64 and then off at 250. While I knew she was near some vineyards, I previously had thought of Loudoun County (where I live) and not Nelson County as Virginia Wine Country. I started noticing a few issues with the car. First, this is my first big trip in the Volvo since June. Why? Mainly because the air conditioning wasn't working properly. So, I found out I can charge it myself, and with the help of my friend Sohrab, I charged it. So, now I have AC, while it doesn't get the car frigid, it does do a good job at making the car bearable to drive, where before, anything over an hour in the vehicle was downright abusive. One thing I noticed is how much power is lost every single time the AC compressor kicks in. It's a noticeable drop in power, that the first time it happened only 10 minutes from my house caused me to almost re-consider going on the trip at all. Second, I noticed a horrible vibration when I was driving over rumble strips that continued after I had passed the strips, which makes me think either a shock absorber or a spring might be broken in the car. Both of those make sense. Third, I noticed I've had a very substantial drop in power in any performance, which makes me think the compression is off somehow in the engine. Not only, but during the 250 mile trip it burned almost a half quart of oil.. While these items were annoying (and at a couple points a bit troubling) they didn't stop me from taking the trip. The Volvo on my Sister's driveway. Originally I was going to drive down to Afton, have a glass of wine, maybe a snack, play Settlers of Catan with my sister and her husband, and then drive back to Northern Virginia. After a few hours (and drinks) I realized there was no way I could even potentially consider driving back home, if I wanted to make it alive. I was falling asleep at the table on the back porch. So, since they're newlyweds, and do not have a guest room, I curled up on the sofa, and woke up at about 8 this morning. Since it was 8 in the morning, and they weren't up yet, I went to sit on the back porch. After my sister got moving, she offered to take me to one of her favorite spots, a winery just a about a mile from her house called Afton Mountain Vineyards. Since I'm a wine snob (there, I said it, I'm incredibly picky, a vintners nightmare, and while I'm no expert about wines, I do know more than the average schmo sitting down to try a glass, and I tend to show it. ), I agreed to go and promptly dropped my expectations. It is, after all in Virginia, and Wine Spectator did say that the only Virginia wine worth anything is at Linden in Linden, Virginia (and by the way, Linden is downright spectacular if you're ever on the I-66 corridor). Since I have had nightmarish experiences sampling certain Virginia vineyards (which will remain unnamed since one of the producers at one of the said horrid vineyards has a rather litigious history), I wasn't expecting too terribly much. 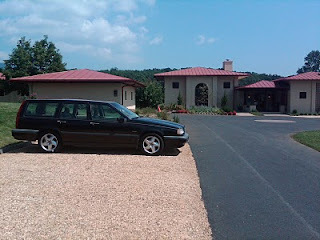 We drove down the long twisty driveway to the tasting room, which is a gorgeous Mediterranean style home set to a backdrop of a beautiful lake, and the blue ridge mountains. It is one of the most beautiful settings I've ever come across. I still wasn't expecting much. I didn't know what my sister knows about wines, and while the wine at her wedding from another nearby (Nelson County) producer Veritas (which I haven't yet been to) was okay, it wasn't anything to write home about, but I wouldn't (and didn't) turn down free bottles if they were offered to me (unlike the litigious producer mentioned earlier). Free bottles of left over wine is, by the way, one of the great perks of volunteering at your sister's wedding. Once inside, you feel as if you are stepping into someone's living room. You make a quick left into the tasting room where you have two choices of what menu to try. My sister and I took their House tasting (she's tried them all, she goes to the vineyard frequent enough they know her on a first name basis). 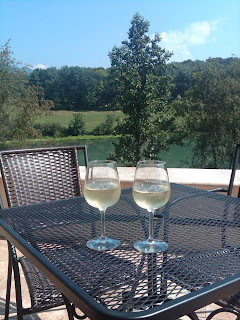 The first wine on the list was the 2008 Steel Chardonnay. It was a very good Chardonnay, and I'm not a white wine drinker, so I don't really have much to compare it to, however, once we got past the Steel Chardonnay, every other wine on the list that we tried was downright amazing. It was all so good that I must say Wine Spectator got it wrong in saying Linden is the only producer in Virginia worth trying. Actually, I'll even go as far as saying that Afton Mountain is BETTER than Linden. Not by miles, mind you, (it's very hard to be miles ahead of Linden, and from what I understand most of the producers in Virginia would definitely agree with me on that) but I strongly prefer the 2008 Reisling and the 2008 Cabernet Franc to anything Linden produces. Unfortunately for you, I had a whole list of adjectives to describe what I was experiencing but I forgot to write them down. So, all I can say from here is, if you're traveling through the Charlottesville area, make sure you stop there. We ended up getting a brief sneak peak about whats upcoming at the Vineyard for the 2009 vintage. I must say, I will be saving for my next trip down. Just the small sample I got has me chomping at the bit for what is to come. In the end I bought three bottles, a t-shirt, and a souvenir tasting glass. The Gewurztraminer (2008), the Cabernet Franc (2008) And the Reisling spoke strongly enough to me that they're the bottles I decided to bring home. I am definitely looking forward to a return trip, and hopefully next time bringing home cases. The trip home was uneventful with the exception of rolling over to 134,000 miles. The most exciting part of the trip, however, was definitely realizing that I came across a spectacular wine producer before Wine Spectator. It's not every day you beat the "experts" to the punch! 8/29/10- This post has been modified from its original text to correct a few grammar mistakes. I spent most of the day today driving around Northern Virginia running errands. After a falling out with my former bank, I signed up at a local credit union. The problem I had with today, however is it is HOT. At one point the temperature gauge in the Volvo registered at 120 degrees. While I know it wasn't exactly that hot, it might as well have been. The lack of air conditioning is starting to annoy me again...even though I'm still thrilled to have the car back, I would much rather be able to just sit in place with the windows down rather than be buffeted by 60 mile per hour winds on 28. The big problem is, it would cost $1000 to fix, while that doesn't seem too bad on the surface, the car is only worth about that to begin with, so it's not worth the expense. When I get a replacement car at some point, I'll keep the Volvo to drive around during the winter. In the meantime, it's manual air conditioning and shady parking spaces for me. The fact of the matter is the little bugger held up VERY well, even though it turned over to 181,000 miles on the return trip. The trip down was miserable. It took nearly 8 hours due to very heavy beach traffic on I-95. It took four hours just to get to Richmond, once you add in a stop for lunch, two stops for the bathroom, and the regular 3 hours it normally takes to get from Richmond to Winston-Salem, and the entire trip down was just excruciating. The lunch stop was at an unremarkable chain sandwich shop, so there is really no reason to expand on that. When we got to Richmond, however, we quickly discovered that the Hotel we were going to be staying in was so new, that the road it is on was not in my GPS unit. So, we had to guess where it was based on other places that were nearby. Once past Richmond, traffic moved nicely on I-85. So nicely in fact, that we made the three hour trip in only 2.5. The hotel does deserve a mention, for one reason. While it was just a standard Hilton Garden Inn, nothing spectacular there...Hilton has decided to change out the mattresses to a set that while in theory should be a better bet, however, they were horrid. I have never slept on a bed that was that hard in my entire life. I think laying on the floor on the carpet alone might have been softer. After checking out, I found out the beds are actually adjustable, so if I wanted a softer bed, I merely needed to adjust the firmness on the side of the mattress. The person checking me in was supposed to tell me about it, but they didn't. So, after only 2 hours of sleep it was time for the return trip. The return trip was fast. Very fast. For most of the trip back I kept the Nissan at around 80 mph. While 80 seems fast, I was in the slow lane passing no one. In fact, I moved to the far right lane because I was getting my doors blown off on both sides by cars going easily 20-30 miles per hour faster than I was. I still made it back in record time, only 4.5 hours including a stop for gas, and a stop for a bathroom break. When I finally got home I collapsed. I needed to pick the Volvo up today because my school parking sticker is on the back window. When I woke up from my nap, at 8 pm, I headed to Warrenton to get the Volvo. While having AC in the Nissan was very nice, when I got back in the Volvo I realized there was a lot I missed about it. The Volvo feels heavy and solid, the Nissan felt light. 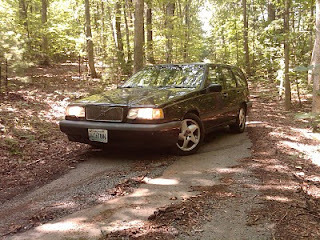 The Volvo has a distinctive smell, one that is very familiar, it's the same smell that was in my 1987 740 Turbo. I missed things as small as the thickness of the steering wheel. The fact of the matter remains, no matter how nice something is that you're borrowing or renting, nothing is as nice as being back on familiar territory. The Volvo is just home to me. While the car isn't exactly the most beautiful thing that's ever been built, it's extremely functional. When I go and twist the key, the car starts, without question. The radio works, it's not the most beautiful sound, but it gets the job done. The only thing I have an issue with right now is the air conditioning makes fart-sounds. It moans and groans all the time. Even with the fart sounds though, it works, which is more than I can say about the Volvo. Yesterday was an incredibly normal day. I drove back and forth in it to work. I had to run to Reston, VA to take some paperwork to my old job, and in the midst of it I got trapped in a massive storm which did a decent amount of damage throughout the DC metro region. One thing I did notice the car does not like is 80 mile per hour winds. However, I can't fault it. Not many cars do. Aside from getting tossed around VA-267 by the wind, the car performed without a fault. The thing I kept realizing about this car, is it easily has another 100,000 miles of life left in it. The engine is strong, the transmission feels solid. It could easily go to 300,000 miles without any issues. At 12 years old, it's very impressive how much life is left in the car. Catch up time and a substitute car. The past two months (June and July) have been so busy, I can't even believe they're already over. Since May 9th, which is my previous mileage tagged entry. 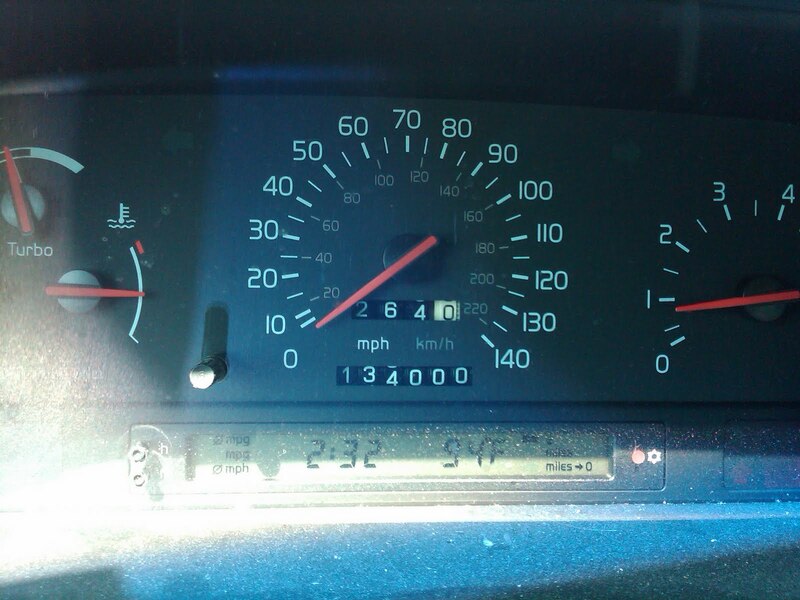 I've driven another 3300 miles putting the odometer on the Volvo right at around 133,300. The surprising thing, however, is that the mileage on the car should rightfully be significantly less than that. The car should only be at about 131,500 based on my daily commute. How did it get that high up? you might ask. The answer is 4 trips down to Harrisonburg. Those trips alone accounted for 1000 of those miles. Unfortunately, three of the trips were due to a family emergency, so they were not logged, and when I was there I didn't get the time to update. One of the trips was for a wedding. The bad part about all of this driving is the Air Conditioning decided to go out on around the 25th of May, which was exactly five days after my most post. This summer has been one of record heat in the DC metro region which has made the car absolutely miserable to drive. Fortunately for me, I've only been going back and forth from my new job which is only 2 miles from my house, and school, which is also only two miles from my house for the most part. The four trips to Harrisonburg were the absolutely most miserable experiences of my life. This weekend, I have a wedding in Raleigh, North Carolina. The five hour drive down and five hour drive back seemed just a bit too much to handle, so I decided to enlist the assistance of my aunt, and have borrowed a substitute vehicle for the trip down and back. The car is a 1998 Nissan Altima GXE, which is the only car from anyone I know I could borrow which I'd be able to include in the blog. Why? It's over 100,000 miles. At 180,000 miles on the odometer, the car has so far been a surprise for one, rather large, reason: unlike the Volvo, on this car everything still works. So far, my only issue is one of the speakers has dried out giving off a buzzing sound, but after 10-15 minutes, while the buzzing remains, you no longer notice it. While I picked the car apart for the first bit, after a few miles down the road, I realized it is a very solid vehicle, even with the extremely high mileage. The fact of the matter is, the car doesn't feel at all like it's nearly got 200,000 miles on it. Tomorrow I'll get to drive during the heat of the day, and I can say without a doubt in my mind, the most exciting thing about driving this car for a few days is going to be seeing what it's like to drive a car with AC again.